Mumford & Sons have announced details of their third studio album Wilder Mind, which will be released in North America through Glassnote Records on May 4. It is produced by James Ford (Arctic Monkeys, HAIM, Florence & The Machine). It features twelve new tracks, written collaboratively by the band in London, Brooklyn, and Texas. A number of the new songs were written and demoed at Aaron Dessner's (The National) garage studios in Brooklyn. The band also returned to Eastcote Studios in London, where they recorded Sigh No More, for further writing and demo sessions. The album was recorded at AIR studios in London. 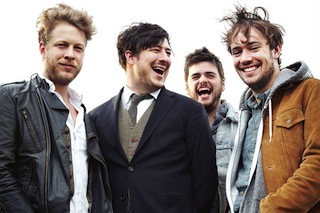 "Towards the end of the Babel tour, we'd always play new songs during soundchecks, and none of them featured the banjo, or a kick-drum," says Marcus Mumford. "And demoing with Aaron meant that, when we took a break, we knew it wasn't going to involve acoustic instruments. We didn't say: 'No acoustic instruments.' But I think all of us had this desire to shake it up. The songwriting hasn't changed drastically; it was led more by a desire to not do the same thing again. Plus, we fell back in love with drums! It's as simple as that." "It felt completely natural, though," says Ben Lovett, "like it did when we started out. It was very much a case of, if someone was playing an electric guitar, drums were going to complement that best; and, sonically, it then made sense to add a synth or an organ. We chose instruments that played well off each other, rather than consciously trying to overhaul it."